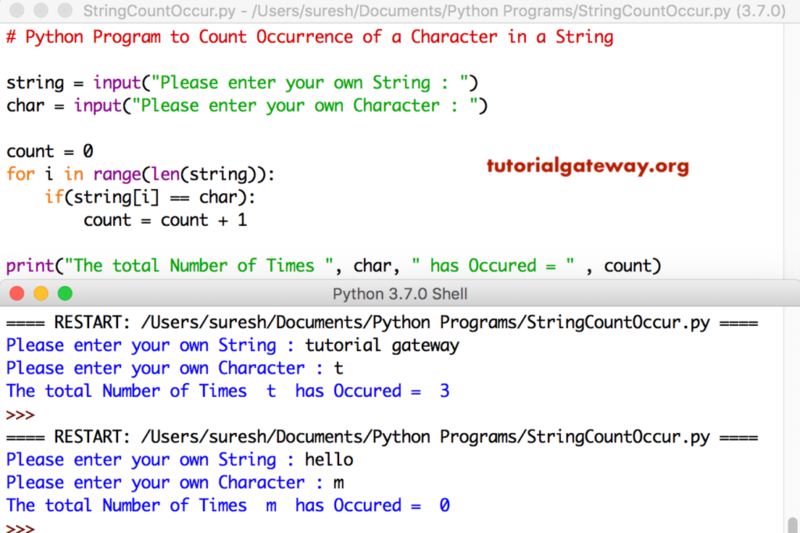 In this article, we will show you, How to write a Python Program to Count Occurrence of a Character in a String with practical example. This python program allows you to enter a string, and a character. Here, we used For Loop to iterate each and every character in a String. Inside the For Loop, we used If statement to check whether any character in a string is equal to given character or not. If true, then count = count + 1.
if(t == t) – Condition is True. if(u == l) – Condition is false. if(string == char) => if(t == t) – Condition is True. This count total occurrence of a character in a string program in python is same as above. However, we just replaced the For Loop with While Loop.